Petrie is now a member of our happy ferret family. Our little guy makes #12 and is the most vocal of all my ferrets. 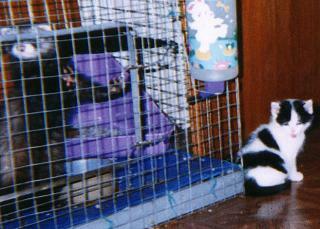 Here is Petrie with the two kittens my daughter rescued. Some real nice person had thrown these kittens in a dumpster sealed in a cardboard box. My daughter heard a faint mewing and checked to see where it was coming from. The two kittens now live with us and are part of our growing family. Baby Girl and Freckles were so tiny that they had trouble walking and didn't know how to eat when she brought them home. I can't understand how anyone could throw these beautiful kittens in a dumpster. They have to be very sick individuals to do this to any animal. I wonder how they treat their own children?